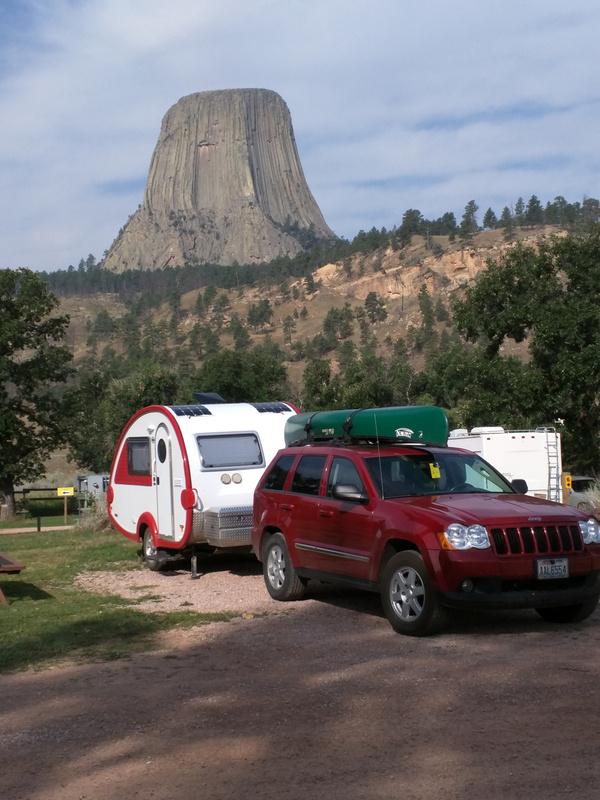 August 31, 2015 – Devil’s Tower, WY – Complications in finding a place to park for the night lead to a late night side trip and a morning surprise. Coming down off of Power River Pass, the road hooks back up with I-90 at Buffalo and I was in the mood to gain some ground towards the Black Hills. But the light was waning before I was really close enough to explore and find a campground. I tried a rest area but they were full of signs disallowing sleeping in your car. So I pulled out the phone and started looking for a place (happily I was back in the USA, and had cell service). I found a KOA that wasn’t too far away it seemed, and according to the description it was “right next to the Devil’s Tower”. So I called to check if they had a spot and they did, they said the office was closing at 9pm and it was a little after 8pm. She told me I should be there before they closed, but “don’t hurry there are a lot of deer on that road!” So I put the address into the GPS and drove off rather blindly but determined to get there by 9pm. Good thing I used the GPS. I didn’t realize that I was supposed to head north of I-90, and I would have tried to avoid getting back on the interstate, which wouldn’t have worked well. I finally got on the long road north across the hills and it was a 65 mph road. I toned that down to about 55 mph for the risk of deer, and settled in. But soon enough there was a car coming up behind me. I moved over and gave him room to pass, and then I used him as an early warning system and increased my speed. I gave him a lot of room, knowing that if he did see a deer he was going to be stopping pretty quick. It wasn’t but two turns later that he came to the first of the deer. We were dipping through a small draw and he had just crossed the stream. I was still coming down into the draw so I could actually see what was in front of him. Brake lights came on, the deer ran out and back and then alongside the road. Plenty of time for me to slow down, much less time for the guy in a hurry. He jammed his brakes, avoided the deer and got back up to speed. But this scene played out twice more before he turned off. 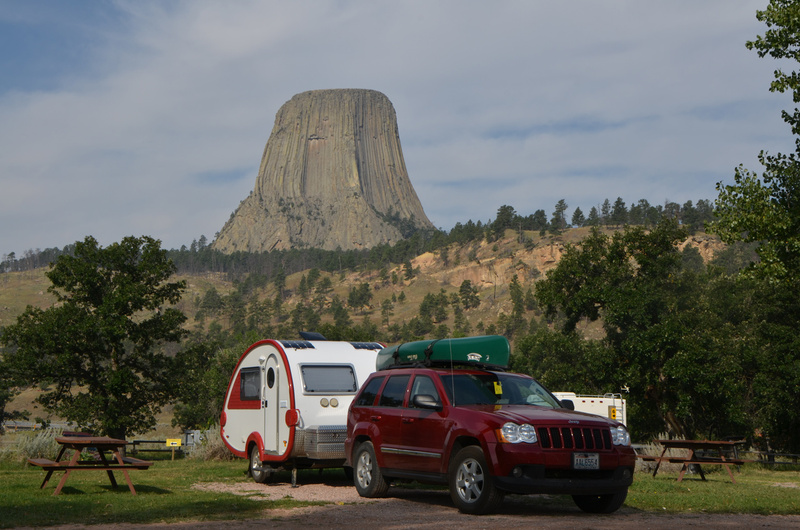 I arrived at the campground with about five minutes to spare, got registered, and set up the trailer. Wi-Fi was good so I set some photos to uploading, and went for a shower. The showers were nice, a separate room/door for each on the back of the building. FYI: This is how scout camps have started building shower and restroom facilities as well. It makes protection of privacy/modesty a lot simpler, and avoids having to have four facilities for men/women/boys/girls. When I was back at the trailer I started wondering at a pretty loud audio track I was hearing coming from the admin building area. It sounded like someone was watching TV and had it on outdoor speakers. I wandered over and found that they were showing “Close Encounters of the Third Kind” outdoors on a big screen and folks were gathered around watching it. I’m guessing this is a nightly occurrence. I opted not to watch it even though it has been so long I’ve forgotten most of the mashed potato and other scenes. Having been up pretty late I was a little late getting going. When I came out of the trailer it was a bright blue sky and a pleasant temperature. But then I turned to the right and was surprised at just how prominent the tower is. For that matter it was strange just how very well positioned things were for a photo with my rig. I visited the monument proper and drove up to the visitor’s center. I went inside and looked around quickly and got my national parks passport stamped. I have to say over the trip I forgot to bring this more often that I remembered. I was on a bit of a tight schedule, I wanted to get down the road, so I didn’t walk the trails. On arriving back at the trailer I met a very nice gentleman who was interested in the trailer, and we had a nice chat. I drove back to the park entrance, but stopped at the prairie dog town. 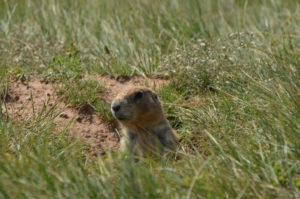 The open fields along the road are open and grassy, with quite a colony of prairie dogs. They pop up out of the holes and back down, sometime running across the grass to another. There were plenty right up along the edge of the road. I spent a few minutes watching, and taking pics of them. 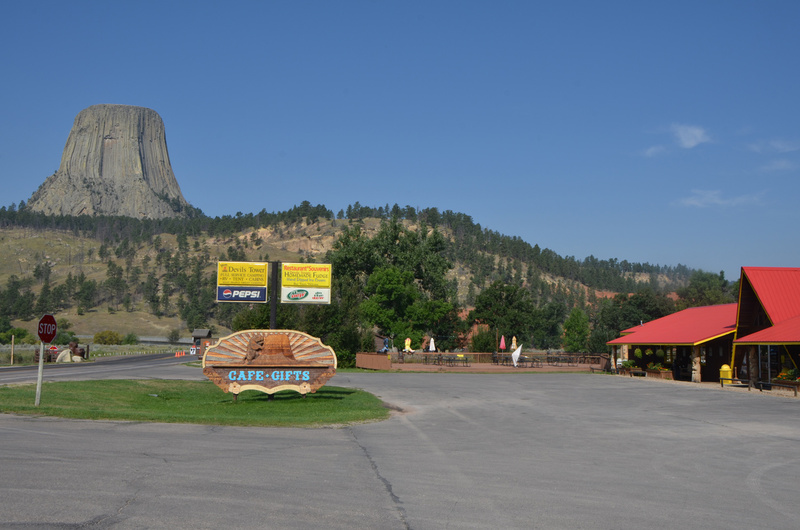 But I was determined to get to Mount Rushmore and beyond, so away I went. It is really very large. Sometimes they will run between holes. Tower from a viewpoint a few miles down the road.